The drive is an integral component of any bicycle. It is composed of a crank and the front chainrings, the front derailleur, the chain, the cassette, and the rear derailleur. In a sense, the gear levers on the handlebar are also part of the drive. Drives differ in technology and construction depending on their use. The drivetrain of a road bike is optimized for precise gear changes, close ratio gears, maximum performance, and minimum weight. When it comes to mountain bikes, stability and durability, resistance to dirt and water and low weight have the highest priority. Apart from the design of the components, the gear ratios constitute a main difference between road and mountain bikes. The gear ratio of mountain bikes is designed for long, steep ascents on off-road trails while road bikes have "thick" gears for road use. Most road bikes use double cranks, mountain bikes run on single, double, or even triple cranks. Road bike cassettes are usually 10- or 11-speed. Mountain bikes range from 7-speed (downhill) to 11-speed versions. 1x11 is currently the most popular configuration. The chain is responsible for power transmission and precise gear switching. The individual chain links are riveted with bolts. In order to change the length of the chain, you need a special chain tool. Quick release chain links are an alternative. 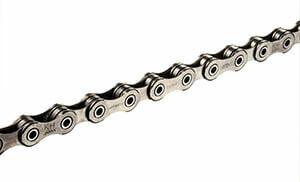 Chain links are nickel-plated for lubrication and durability. 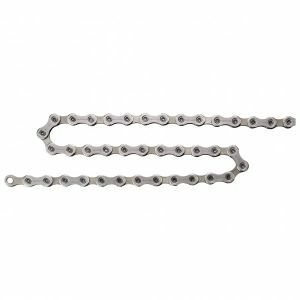 In order to achieve a maximum performance, a chain needs regular cleaning and maintenance with ceramic or wax-based chain oil. The correct chain length is crucial when it comes to preventing wear. The chain should never be stretched diagonally from chainring to cassette i.e. big (chainring) to big (cassette) or small to small. Generally speaking: An easier transmission is better for your legs. However, you shouldn't feel like you're pedaling thin air. Road bike gear levers are hidden within the brake lever so that rider's finger is on the trigger at all times. Mountain bike gears are changed via a gear lever or, in some cases, by twist handle. Gear levers and front derailleurs/rear derailleurs by Shimano are incompatible with SRAM components, since their bowden cables have different transmission ratios. As with other bicycle parts, the end justifies the means. Derailleur systems are available for every need and budget. If you are clear about what you need and what your budget is, you won't have trouble finding a suitable product. If you are renewing your drivetrain, you should budget for equipment such as a chain gauge, chain tool and other component-specific tools. Regular cleaning, servicing and maintenance extends the lifetime of the materials and guarantees maximum performance.